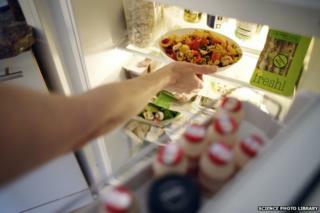 How safe is mouldy food to eat? British families throw away about seven million tonnes of food and drink every year, enough to fill Wembley stadium to the brim. Most of it is beyond its sell-by date, but how much could be safely eaten, asks Michael Mosley. I've agreed to feast on a range of foods that have gone beyond their prime, guided by mould expert, Dr Patrick Hickey. I realise it is going to be an unusual lunch when Hickey passes me a disposable contamination suit to wear. Before tucking in he also warns me that we will not be eating any foods that have passed their "use by" date. To do so would risk serious food poisoning. With "best before" or "sell by" things are more flexible. Our first course was some ageing cheddar. As he cuts away the mouldy part (being careful that the knife doesn't get contaminated by mould) he assures me the rest is safe to eat. Cheddar and parmesan are dry cheeses and because mould needs moisture to thrive, it doesn't normally penetrate far below the surface. With most soft cheeses, however, unless the fungus has been deliberately introduced, the presence of mould suggests infection not just by unwelcome fungi but also harmful bacteria, such as listeria or salmonella. If that happens, throw it away. Next, he pulls out some bread covered in small bits of white-and-blue mould. He assures me that it will be fine, toasted, once the mouldy crusts have been cut off. "The moulds don't go deep," he says. "The time you really need to be worried about bread is when it has black bits on it." I decide to pass. Then he digs out some long-forgotten vegetables from the back of a fridge. The courgettes and carrots are covered in a horrible slime, which Hickey tells me is caused by bacterial colonies growing on the surface. Could I boil these up for soup? "If you did," he says, "you'd probably develop terrible stomach ache in a couple of hours, followed by stomach cramps and diarrhoea"
Fruit normally lasts better than vegetables because the acid in fruit keeps harmful bacteria at bay. The moulds you find on jam, are fine - just scrape them off. There is, however, one fruit to be wary of. "Apples," he tells me, "will keep for ages, but if there's a puncture in the skin, fungi can get in. There have been serious outbreaks in the past, incidents of people being poisoned by drinking bad apple juice, which contains a toxin called patulin." "This fungus," says Hickey, "produces one of the most deadly toxins known to humankind. The toxin accumulates in the liver and can cause liver cancer. If there's no mould on the shell and the internal part is sealed and protected, which these are, then we should be fine." He is right. We eat them. We survive. Although most foods are best eaten fresh, some starchy foods, such as pasta, rice and potatoes, may actually be healthier when consumed as leftovers rather than freshly cooked. Certainly better than tipping in the bin. As I discovered in last week's episode of Trust Me I'm a Doctor, cooking starchy foods and then cooling them down changes their structure, so they become more resistant to the enzymes in our gut that break carbohydrates down. So if you eat cold pasta your body will absorb fewer calories, making this a dieter's dream. What's even more surprising is that if you take cold pasta and reheat it, then it becomes even more "resistant", producing a 50% lower rise in blood glucose than fresh pasta. Although we didn't test it, the same probably happens when you cool and heat other starchy foods like rice. You should never reheat cooked rice that has been left hanging around at room temperature for any length of time, because it can harbour toxins that will give you food poisoning. But if leftover rice goes straight into the fridge after a meal it will be fine for a couple of days. I often use leftover rice to make egg fried rice. The same applies to potatoes. Cold leftover potatoes, sliced and then lightly fried are a family favourite. When you buy a large loaf of sliced bread, put half in the freezer. It will keep far longer and make good toast. It should also be a more "resistant" form of starch. Soft tomatoes can be cooked or turned into salsa. Here is one recipe which uses up both soft tomatoes and stale bread. Overripe bananas can be used to make banana bread. The browner the better!